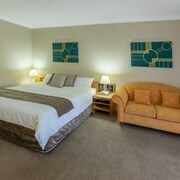 Situated in West Wyalong, this hotel is 0.4 mi (0.6 km) from Holland Park Swim Centre and within 3 mi (5 km) of Coorinda Park and Wyalong Museum. 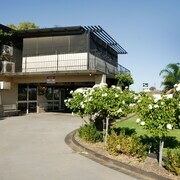 Situated in West Wyalong, this golf motel is 2.2 mi (3.5 km) from Holland Park Swim Centre and within 6 mi (10 km) of Coorinda Park and Wyalong Museum. Great accommodation, clean and spacious. The owner is warm and welcoming, will definitely stay here again. Which hotels are closest to the West Wyalong airport? Where to stay near top West Wyalong attractions? What kind of hotels are in West Wyalong? Which hotel chains are in West Wyalong? Visitors can enjoy all that West Wyalong has to offer including the golf courses, spas, and local tours. Tourists can also enjoy all the city has to offer including its bars. 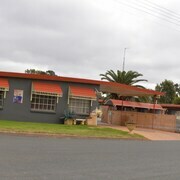 In West Wyalong, there are 7 hotels and other accommodations to choose from. A favorite place to visit in the city is Holland Park Swim Centre. 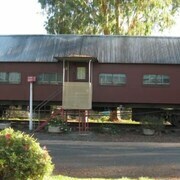 In the area, you'll also find Coorinda Park and Wyalong Museum. Mayfair Motel - With a stay at this 3-star motel, guests can enjoy access to an outdoor pool and free parking, along with free WiFi. It's a favorite with Expedia travelers for its overall value and clean, comfortable rooms. West Wyalong Caravan Park - With a stay at this 2-star campground, guests can enjoy access to free parking and laundry facilities, along with an in-room kitchenette. 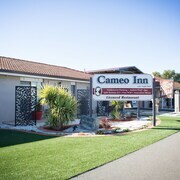 Cameo Inn Motel - This 3-star motel features a restaurant, an indoor pool, and free WiFi. Expedia customers like its dining options and overall value. To explore the surrounding area, ride one of the trains from Calleen Station or Wyalong Station. West Wyalong may not have many public transit choices so consider a car rental to maximize your time. Are there hotels in cities near West Wyalong? 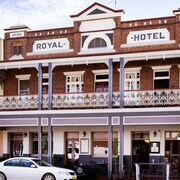 Explore West Wyalong with Expedia.com.au’s Travel Guides to find the best flights, cars, holiday packages and more!